Approximately 8.1 million Americans or 3.5% of the total U.S. population learned that they were victims of identity fraud in 2010. * Identity fraud is the use of someone else's personal information for gain-the act of obtaining that information is the work of identity thieves. However, many acts of identity fraud are not committed by identity thieves. Identity thieves often harvest as much personal information as they can and sell it to the highest bidder. That is why an act of identity fraud once discovered, is often far removed from the actions of the identity thief who acquired your personal information. Even in our digitized world, physical documents accounted for 43% of all identity theft, while online methods accounted for only 11% in 2009. * We often don’t realize how much personal information is contained in documents we discard. 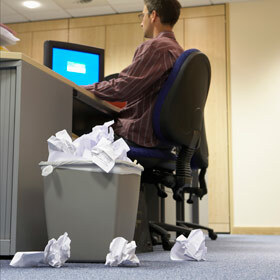 A habit of regularly shredding documents is one of the easiest ways to prevent identity theft. But paper is so prominent in our everyday lives, what exactly do we need to shred? Anatomy of an Identity Theft, or What’s In Your Dumpster? Identity thieves can piece together your identity from discarded documents found at one location, sometimes in the same garbage bag.